Did you know that the neighborhood of Kensington used to be a hot spot for breweries in the 19th century? Are you looking for a new Taproom to check out in Philadelphia? 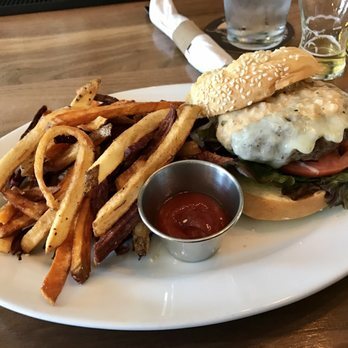 Well, St. Benjamin Brewing Company is the perfect place to visit for some quality craft beer and enjoyable food! In the lovely, authentic neighborhood of Kensington, this innovative brewing company is continually impressing locals and Philly newcomers with their craft beer and tasty food. The St. Benjamin Brewing Company has been around for about two and a half years, but almost six months ago they expanded their brewery by adding a Taproom. With this addition, St. Benjamin is the only brewery in Kensington to have a Taproom. The building that houses both the brewery and Taproom is an important aspect of the brewing company due to its historical connection to the Philadelphia breweries in the 1800s. Before St. Benjamin and various other businesses, Theodore Finkenauer opened a brewery in the exact location more than two centuries ago. The Theo Finkenauer Brewery was one of the many breweries to exist in North Philadelphia during this period of time. To help emphasize their connection to the history of Philadelphia breweries, every single St. Benjamin keg has the image of “The First American” (Benjamin Franklin) on it. Although the brewery has only been around for a little less than three years, they have grown tremendously within the last year. St. Benjamin is a place where Kensington locals can enjoy a nice craft beer close to home. Tim Patton is the man behind Saint Benjamin Brewing Company. Before opening a brewery, Tim co-founded Dealcatcher.com and worked as their senior developer for almost 9 years. Once Tim left Dealcatcher, he decided that his next career would be more hands on and community-focused. During his time in the internet business, he began homebrewing and developed an interest in the brewery business. Tim says that the idea behind the beer at his brewery comes from his love of Trappist beers. Saint Benjamin is a play on the Belgian Trappist breweries with a Philadelphia twist added in. Andrew Foss began his brewing career as a homebrewer and worked as an intern at the Barren Hill Brewing Company for about a year. Under Scott Morrison, Andrew learned the ins and outs of brewing before being recommended to Tim for Saint Benjamin. In the brewery, Andrew uses the process of decoction in many of the beers. Decoction is when you boil the mash (grain & liquid combined) to extract more sugar as well as flavor from the grains. Tim and Andrew favor this process because it allows some of the sugars to be caramelized, strengthening the taste without adding more sweetness. Saint Benjamin Brewing Company is a great place for the Kensington locals to enjoy craft beer and delicious food. I visited on a Thursday after work and was relieved when I got there to find that the environment of the Taproom is both welcoming and relaxing, plus you can see what’s going on in the brewery whenever you want! Tim personally showed me the brewery area, where I got a first-hand look at all the high-quality equipment and ingredients they use to produce their various beers. Since I am trying to expand my beer pallet, I decided to get a sampler with two IPAs, a Cream-ale and a Kölsch beer. I figured my favorite would be either IPA but then I tried their Junto Coffee Kölsch. Before tasting the Junto Coffee the only other Kölsch beer I had tried was from Lake Placid Brewery in Lake Placid, NY. The Junto Coffee is a straw-colored Kölsch aged on whole coffee beans from Kensington’s own Reanimator Coffee (I highly recommend!!). Pictured here is their Angus Burger and a side of fries. Image source here. Another awesome thing about Saint Benjamin is the fact that they have a menu full of food options for whatever you are craving! Running both a brewery and restaurant together can be difficult but the staff at Saint Benjamin makes it look easy! When I was there I enjoyed the Angus Burger and I have to say that their homemade remoulade compliments the burger very well. The Taproom offers fifteen delightful food items and a few of the most popular are Shrimp & Grits, Angus Burger, Beer Braised Brisket Melt, and the Grilled Flatbread Pizza. St. Benjamin Brewing Company is the place to check out if you’re a local to North Philadelphia or just a craft beer fan looking for some new brews to try! If you have no idea what I am talking about, feel free to check out my post from last week here and take the quiz yourself! To my fellow readers, I wish you all a happy holiday and a wonderful New Year!